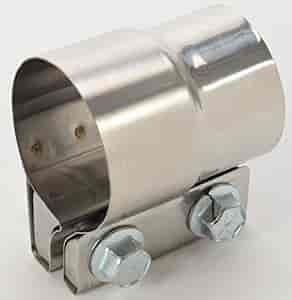 Borla 18003 - Band Clamp Diameter: 2-1/4"
Stainless and Aluminized steel construction. Stainless material resists corrosion and both withstand higher temperatures. Unique design won't crush pipes for smoother exhaust flow. Pre-attached Grade 8 bolts included for easy installation. Stainless steel material withstands high temperatures and provides better looks. Aluminized steel material withstands high temperatures. Easier to install than competitive styles. Pre-attached hardware for easy installation. Grade 8 bolts for high temperature durability. Dynomax Accuseal Clamps offers the clamping force of a U-Bolt Clamp with all the advantages of the Strap Band Clamps. These also let you get very close to a bend in the pipe where a Strap Band Clamp would be too wide to seal well. Made with 430 Bright Stainless Steel. Does Dynomax 33231 fit your vehicle? 33231 is rated 5.0 out of 5 by 3. Rated 5 out of 5 by jeepman41 from Great Stainless Steel Clamp. A really good design versus the saddle type exhaust.clamp. It gives a 360 degree leak free seal. Constructed of top notch material and uses heavy duty hardware. This stainless steel clamp is built to last . Looks and feels like a quality product. Rated 5 out of 5 by Tom z from The Best Band Clamps are the best to remove exhaust pipes with ease, no crimps marks or dents in the pipe. Easy on Easy off. I also use them for the mufflers as well so I can change mufflers at any time for louder or lower sounding ones, takes me about 10 mins a side on a C3 stingray.